And Spartacus taught me that all the bad things men do, they do because they are afraid. This book is for my daughter, Rachel, and for my son, Jonathan. It is a story of brave men and women who lived long ago, and whose names have never been forgotten. The heroes of this story cherished freedom and human dignity, and lived nobly and well. I wrote it so that those who read it, my children and others, may take strength for our own troubled future and that they may struggle against oppression and wrong—so that the dream of Spartacus may come to be in our own time. Fast wrote that dedication in 1951, and I learned from Wikipedia that the “troubled future” he was referring to arose partly out of the communism scare of the 1950s. Fast was one of the oppressed in that struggle, actually imprisoned at one point due to his involvement in the Communist Party USA. In some ways, therefore, I think it makes sense for Fast to see a direct parallel between the oppressions of ancient Rome and the oppressions of 1950s America. There was a disease in them, but the disease did not appear to weaken them. Here they sat, having eaten their fine food, sipping their mellow wine, and those who contested their power were crucified for miles and miles along the Appian Way. 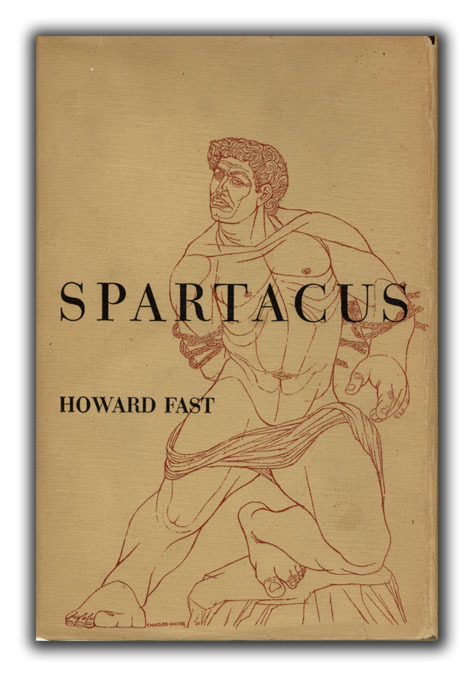 Spartacus was meat; simply meat; like the meat on the cutting table at the butcher shop; not even enough of him to crucify. But no one would ever crucify Antonius Caius, sitting so calmly and surely at the head of the table, speaking of horses, making the extremely logical point that it was better to harness to slaves to a plow than one horse, since there never was a horse which could stand the half-human treatment of slaves. And the second thing that surprised me was how many parallels I saw between the injustices of Fast’s portrait of ancient Rome and those of America in the 2010s. I’m not looking to put a ton of stock in the comparison, nor do I wish to place any kind of political or value judgment on it, but time and again I found myself stumbling across a sentence, or a paragraph, or a section talking about the levers which turn Roman society and realizing, with only the change of one or two words, they could equally describe the drivers of our current environment. Here, for example, is a description of the men paid to oversee the slaves at the gold mines of Nubia, and in it I see some parallels with the millions of middle management, ladder-climbing drones in our modern, corporate world. They are men of Alexandria, bitter, hard men, and they are here because the pay is high, and because they get a percentage of all the gold the mines produce. They are here with their own dreams of wealth and leisure, and with the promise of Roman citizenship when they have served five years in the interest of the corporation. They live for the future, when they will rent an apartment in one of the tenements in Rome, when they will each of them buy three or four or five slave girls to sleep with and to serve them, and when they will spend each day at the games or at the baths, and when they will be drunk each night. They believe that in coming to this hell, they heighten their future earthly heaven; but the truth of the matter is that they, like all prison guards, require the petty lordship of the damned more than perfume and wine and women. Whenever he encountered a millionaire—not merely a man who had millions but one who could spend millions—he was overwhelmed by his own sense of being so small a frog in so small a puddle. When he was a gang leader of the streets of the urbs, his own dream was to accumulate the 400,000 sesterces which would entitle him to admittance into the order of knighthood. When he became a knight, however, he first began to realize what wealth meant, and for all he had climbed—by his own shrewdness too—there was an endless vista of ladder ahead of him. It’s a cynic’s view, perhaps, but I’ve heard these same sentiments expressed in our modern times relative to America’s foreign wars. The people doing the fighting have almost nothing at stake in the outcome, but those with political and financial power have a great deal to lose and to protect, and so the cycle of war and destruction must continue. In other words, it is the truth and, more importantly, a truth that must not be spoken. But Cicero does disagree with Gracchus in one important particular—his underlying premise. But Gracchus doesn’t shrink from this challenge. Quite the reverse. He embraces it and, in doing so, he paints an equally cynical but strangely compelling picture of modern democratic politics. Never belittle politics, indeed. Few of us, then or now, really understand it or can wield it with any expertise. Also like today, most people are inured to the role it plays in their lives and the decisions they make. It’s a thick coat of propaganda that is focused less on distracting them from some horrible truth and focused more on defining the framework by which truth is understood. Most of the Roman citizens in Fast’s work live wholly within this framework. As an example, near the end of the novel, Crassus, the general most responsible for defeating the slave uprising, has purchased Spartacus’ wife, Varinia, and is determined to get her to see the futility of Spartacus’ rebellion. Rome itself, of course, is gone. But many of the ideas that created it are not. As Crassus says, that Rome is eternal. Finally, here are some additional sound bites from that long dialogue between Cicero and Gracchus that just seemed too good to let go unrecorded. Long ago, Cicero had discovered the profound difference between justice and morality. Justice was the tool of the strong, to be used as the strong desired; morality, like the gods, was the illusion of the weak. Slavery was just; only fools—according to Cicero—argued that it was moral. Politics, as he occasionally said, required three unchanging talents and no virtues. More politicians, he claimed, had been destroyed by virtue than by any other cause; and the talents he enumerated in this fashion. The first talent was the ability to choose the winning side. Failing that, the second talent was the ability to extricate oneself from the losing side. And the third talent was never to make an enemy. Only one or two of the chairs were empty. Gracchus, remembering that session, decided that at such moments—moments of crisis and bitter knowledge—the Senate was at its best. The eyes of the old men, who sat so silent in their togas, were full of consequence and without troubled fear, and the faces of the younger men were hard and angry. But all of them were acutely conscious of the dignity of the Roman Senate, and within that context Gracchus could relinquish his cynicism. He knew these men; he knew by what cheap and perverted means they purchased their seats and what a dirty game of politics they played. He knew each and every particular well of filth each and every one of these men kept in his own backyard; and still he felt the thrill and pride of a place among their ranks.